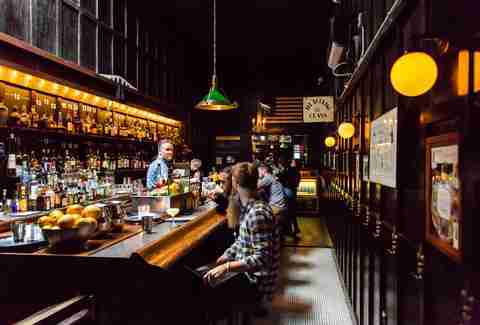 New York City is hardly lacking in bars -- from divey, cash-only spots to of-the-moment craft cocktail joints and speakeasies -- but that doesn’t mean all are suited for a first date. Choosing a first-date bar can be tricky; it needs to be laid-back (to show you aren’t trying too hard) but still special (because you still want to impress your date), and quiet enough that you can actually hear each other talk (but not so quiet that the bartender can hear your awkward first-date conversation). With all of that in mind, these are the best first-date bars in the city. 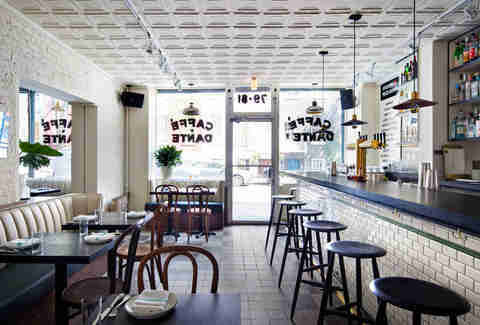 Walking into Dante feels like walking into 1915 New York (when the registered landmark first opened as Caffe Dante) and that nostalgic feeling is what gives it its understated romantic vibes. Things are a little dressed up here (note the restored tin ceilings and leather banquettes) but it’s still casual enough for a first date. 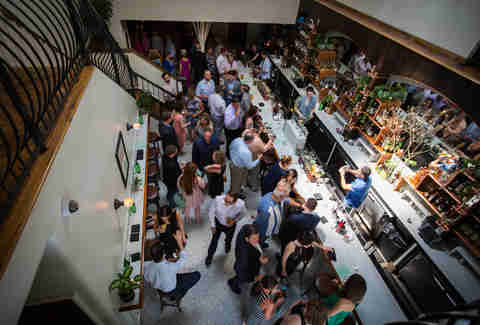 The cocktail selection is vast -- including more than 10 varieties of Negronis, the bar’s signature drink -- and if you’re looking to extend to dinner you’ll find the likes of house-made spaghetti with blue crab, sourdough flatbreads, and burrata. Swell Dive boasts a fun but totally understated tropical theme, making it a perfect spot to bring someone you just met on Bumble this week. 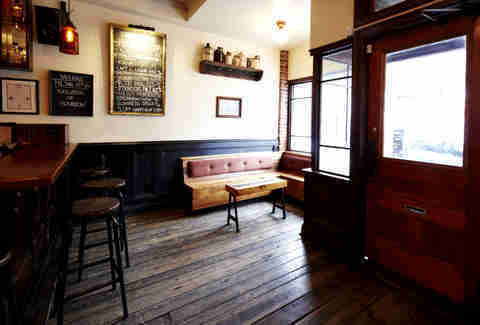 Grab a seat at the minimalist wooden bar inside or, if the weather’s nice, head to the intimate back patio. The cocktails, like the pineapple, coconut creme, and Tito’s vodka Coco Chi, are far from basic, and there’s a solid selection of wine and beer as well. 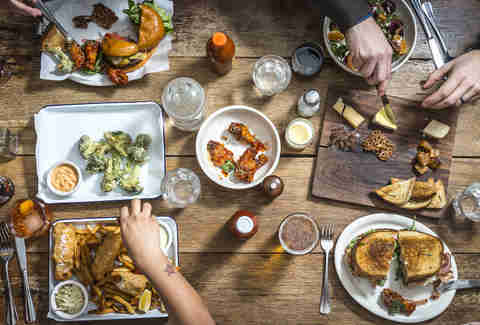 Though you can easily come here just to drink, the Filipino Tex-Mex food menu is casual enough (it’s mainly made up of tacos) to have a non-awkward dinner date, too. 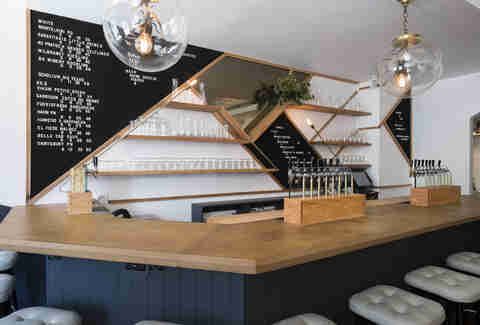 Wine bars are generally always promising first-date options, but Lois sets itself apart from the rest with its 15 on-tap wines and minimalist space that has a cozy living room-meets-science laboratory vibes. The wine selection changes regularly, and you can opt for a glass or three different carafe sizes (if you and your date land on a mutual favorite). There are also small plates like cheese plates, avocado arepas, and meatball subs. 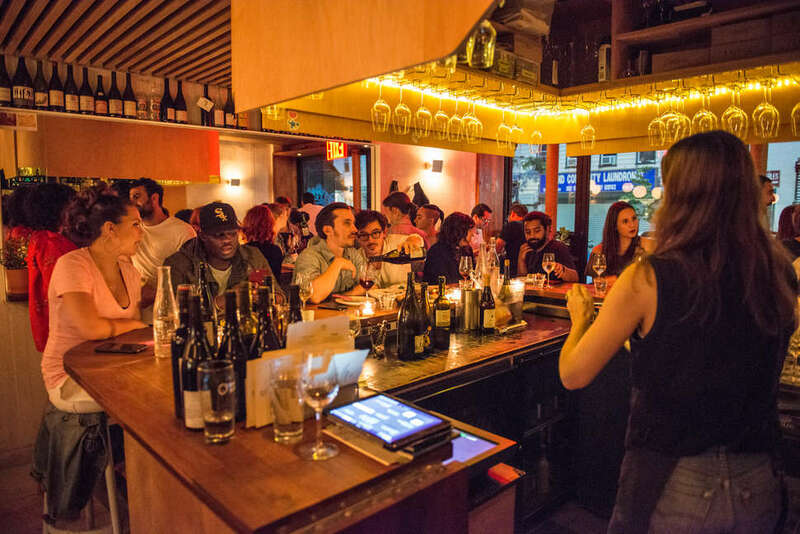 This tiny wine bar from James Murphy of LCD Soundsystem was an ideal date spot long before it was featured on Master of None as Aziz Ansari’s character’s Tinder date go-to. 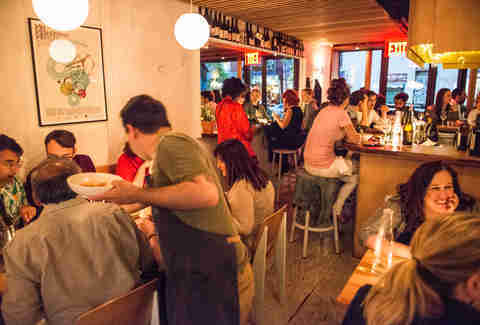 The space is split between bar seating in the front and a sit-down restaurant in the back, which means you can easily turn a good drinks date into a full-on dinner with small plates like gnocchi and beef tartare. The Wayland is one of those rare, neighborhood-y bars that works for just about every scenario, including a casual first date. 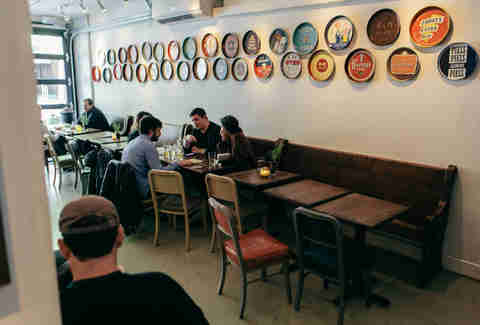 The space is laid-back without being divey (the focus here is on craft cocktails), and it’s always lively without feeling overcrowded (so you’ll actually be able to hear your date talk). As an added bonus, the bar hosts live bands most nights of the week. Few bars on the Upper East Side are as versatile as The Penrose. The large two-room space feels like a Downtown bar (specifically its sister bars, The Wren and Wilfie & Nell) and has a casual feel that’s balanced out by dim lighting and a dark, cavernous interior. The drink menu checks off all the beer, wine, and cocktail categories, but the real draw is the “top shelf cocktails” section, where you’ll find strong concoctions like the rye, cognac, and absinthe Prescription Sazerac. You can get a table in the back as long as the place isn’t packed (it usually is on weekends). 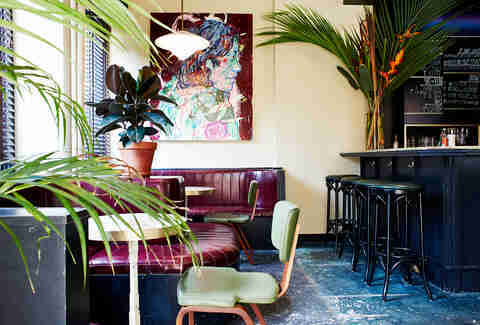 Located on a corner deep in Chinatown essentially underneath the Manhattan Bridge, Mr. Fong’s has the unassuming exterior of a dive bar but the interior of a ritzy, mid-century Chinese lounge -- all without trying too hard. 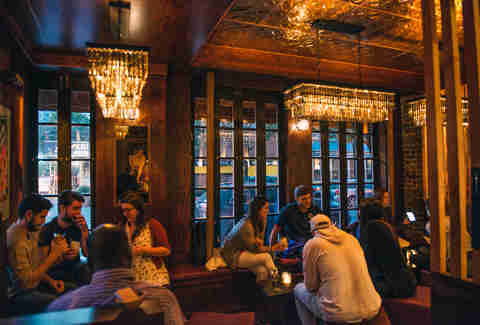 The dimly lit space has few intimate booths plus a long bar with plenty of seats (if you’re looking for something a little more open), and there's affordable cocktails, wine, and beer. The place gets pretty packed at night Thursday-Saturday, so this is a good early-in-the-week date spot. Ramona is the perfect place for an intimate first date that doesn’t scream “intimate first date” -- that’s because the bi-level space is big and open, but still maintains a date-night vibe with a beautiful marble bar filled with plenty of seats for quiet conversation, as well as lots of candle-lit tables upstairs. Drinks run the gamut from tequila, gin, rum, and whiskey cocktails to frosé and beer. 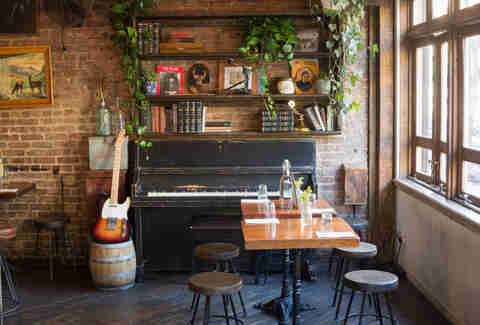 Away from the congested bars on Bedford Avenue, in the quiet part of Williamsburg close to the Lorimer and Graham stops, you’ll find this low-key but still intimate spot with dark, vintage-y wooden floors and tables, plus a quiet back patio. The focus here is on two things: whiskey and grilled cheese. There are 12 beers on tap if brown liquor isn’t your thing, but the extensive grilled cheese menu can’t be missed. Taking its name from the modern woman of 1920s Japan (“moga” are the Japanese equivalent of flappers), this West Village cocktail bar is unique to New York in its commitment to serving wines produced by women. Aside from the wine collection, the unique cocktail menu -- which leans heavily on Asian influences -- makes Bar Moga a great date spot. You can get a table without ordering something to eat, but you should definitely try the silky smooth omurice omelette. If your date is remotely close to a beer nerd -- or at least appreciates beer -- then Covenhoven is a perfect choice for a first date. The vast beer selection emphasizes local brews, which can be paired with beer-appropriate snacks like hot pretzels and sandwiches. Grab a seat at one of the candlelit tables, and if the conversation runs dry, head to the board game collection. 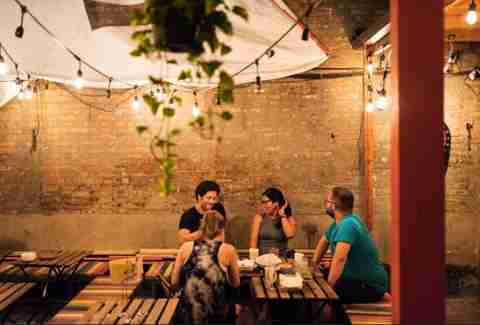 Even if you’re not a Queens local, Dutch Kills is certainly worth the trip to LIC for a first date. The pseudo-speakeasy boasts a cozy interior with heavy dark wood accents and leather stools, and an expert staff of bartenders mix innovative cocktails you won’t find elsewhere. Your best move is to go off the menu and order the bartender’s choice (just tell them the base spirit and they do the rest). Elaheh Nozari is a former editor at Thrillist. She’s been on a lot of first dates! Slide into her DMs @ellie2635.